My father-in-law actually managed the chateau I wrote about briefly, and our family had a memorable stay inside. As an aspiring mystery writer, I couldn't resist describing the former owner's quirky art work or the chateau's enviable setting. Now my mysteries have been honored twice by Writer's Digest, and my latest FOR BETTER OR WORSE is shortlisted for the Chanticleer International Mystery & Mayhem Book Award. 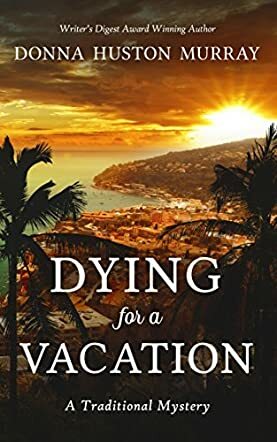 Dying For A Vacation: A Traditional Mystery by Donna Murray is a murder mystery set in France. Richard, an artist, is offered a chance to get away from it all when his old roommate, Tom, asks him to look after his chateau while he goes on honeymoon with his wife, Maria. The chateau has been the target of vandals and now it seems that the death of Maria’s mother may not have been the accident it was thought to be. Tom has hired repairers to fix the vandalism and the vandals won’t be back – will they? Everything is not all it seems to be; who is the strange man watching the chateau? And murder? Well, that only happens in books – doesn’t it? Dying For A Vacation: A Traditional Mystery by Donna Murray is a good mystery with solid characters. Donna has developed her characters as real people, people that we come to know and empathize with throughout the story. The plot, in my opinion, takes a while to come together but when it does, it springs into action. The descriptions in the story brought the surroundings and the characters to life quite nicely and there is enough action to keep you interested in the chain of events. The plot was quite simple, nothing complicated to get lost in, and an easy read if you have a few hours spare or need to kill time. It is an entertaining story and fans of sleuth novels and murder mysteries will really enjoy it.